Have you ever considered the luxury of having a Personal Chef cooking for you and your family in the privacy of your own home? 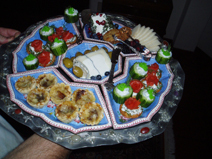 Would you like to have special family meals, or small catered parties designed for you? Perhaps a couple days a week, or a few times a month, you may not feel like cooking; but you still want nice meals at home. Allow a professional chef to prepare your meals and do all the shopping. Book your calendar dates today! !